The Borg have returned! A starship from the future has materialized to warn of the latest Borg threat. You are in charge of the fleets on Federation, Klingon, Romulan, and Borg ships that will wage this epic battle. Build starships, construct space stations, and research special weapons to lead your side to victory. Along the way, you will survive a Klingon civil war, Romulan subterfuge, and the Borg's search for perfection. The future is in your command. Star Trek: Armada is the first real-time 3-D strategy game set in the Star Trek: The Next Generation universe. In various campaigns, the player assumes command of the fleets of the Federation, Klingon, Romulan, and Borg, using up to 30 starships in dynamic ship-to-ship combat as well as overseeing the construction, repair, and staffing of the ships. Star Trek games are for some reason notoriously awful. I'm not sure if developers are intimidated by the fame of the series, or if there simply aren't very many programmers who can handle the Wing Commander level many of us gamers expect from a good space game. While Armada is better than most, it still could be so much more. Yes, you can be one of four groups - the Federation, the Klingons, the Romulans, or the Borg. Each has its own ships and bases, and special abilities. The graphics are Homeworld-esque - very lovely, with details on ships and other stellar objects. I grew up loving Star Trek, and it is neat to be able to manipulate the ships. However, playing is like sliding miniatures around on a glass tabletop. Where is the space aspect of this? Scales are not always proper as they slide from Point A to Point B. You do traditional StarCraft types of operations - mine your dilithium, build your base, kick out fighting units, take out the enemy. Instead of choosing an attack stance, you choose the red/yellow/green alert. Getting into the game is extremely difficult for new players. The manual itself is not very helpful, and the commands are not always intuitive. One of our test machines was a P2-266, which they list as supported, but the machine only ran at the lowest graphic setting available, choking constantly. Even on faster systems the crash rate is rather impressive. I really, really wanted to enjoy this as a strategy game. My love of Trek tried to get me to overlook some of the flaws. However, no matter how gorgeous the ships themselves and the generated mid-game cinematics, the AI is simply lacking and the gameplay itself is nothing special when compared to other strategy games out there. A great game for strategy game players. Star Trek fans will love it, science fiction fans will love it, gamers will like it. Give it a few months. Straight and simple: Wait for a couple more patches. It has the potential to be a great game, but the game is presently just loaded with bugs that Activision was just too lazy to fix in the Beta versions. "The game crashes while playing in windows xp", it only happened with me twice. Life span of the game is defiantly short. The story line is perfectly imitative from the original star trek series. If you are a star trek fan, you will enjoy it. As for me, I'll continue with Starcraft and hope that a game is released soon. Good game, Better than star craft. Star Trek Armada is : A very good game! What do you get when you have millions of trekkies or trekkers wanting to play Star Trek on a broad level but don't want to be restricted to one race? You get the latest game to hit the compters, Star Trek Armada. Now you can control multiple starships ranging from Federation, Klingon, Romulan and our favorite, the Borg. Following some of the same guidlines found in Blizzard's Starcraft, you must play 4 chapters in the struggle with a fight to fend off the Borg. You mine dilitium moons and build starbases in space to amass huge armadas of ships to do battle with. Each chapter focuses on a specific race that you must control and successfully complete each mission. It does make for some fun game play and insight into a story created for this game. The graphics are very nice and you do get a sense of what it is to control ships and manage space stations in space. Although alot of the screen is taken up by menu boxes that can be removed, the ability to zoom out my have you scrolling like crazy to manage your space battles. As for the cutscences, they are not anything to write home about, but they are nice. The gameplay is a little awakward to get used to. You are limited on what you can build depending on your mission and even then it is time consuming to build up a sizeable force. This would have been taken care of if you were able to manipulate your ships more instead of moving near another ship and firing. I really wish they would have allowed you to allow your ships to make evasive manuevers rather than just sit next to enemy and exchange fire until one is dead. The ability to have more control over a few ships would not make it necessary to amass huge armies of ships to attack the enemy terriortory. Being able to target specific systems on ships with firepower would be nice too. Are you listening Activision? I hope so. At least enemy ships do the the brains to retreat when they become heavily damaged. But even so the AI is not too smart. Wow--what a great game. The graphics and sound are great, the strategy a blast --just 2 comments I didn't see below. 1) Even after you're done with the missions, by going into the Multiplayer area and chosing instant action, you can play against as many as 7 other Computer AI driven enemies, on a series of maps included with the softwear --so the fun literally never ends while you play game after game with no two exactly alike. The Computer AI is exceptional, and you can set AI enemies to ally with you or each other in a series of neverending combinations. I have to admit, it does look a whole lot like StarCraft, except has a whole lot more bugs. But it is a GOOD game. Despite the lack of single player missions, and a storyline, the multiplayer functionality is quite good. I gave this game up for Diablo II pretty quick, but not after a good 2 weeks or so of a good time playing. Where are all the Intrepid-Class ships at? I was unimpressed with this game. The races are too similar to each other. The ships within each race do not differ much except in size. Mouse control is painfully sluggish. Space is two-dimensional - ...Resource collection is uncreative. Several ship classes are missing, such as the Intrepids. Only 8 ships can be selected at a time. 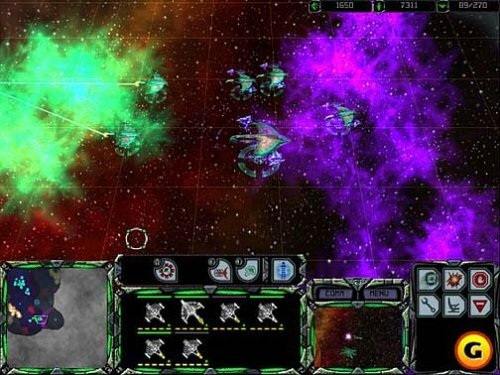 Whether I played the Borg or the Federation, I got the feeling that I was just building the same things with different graphics in a [copy] of Starcraft. One of the Best Star Trek games Out there. I've played ST: Armada all the way through all the scenarios and I must say that while the game is fun, the Borg were made just way too powerful. The Federation ships are ok, but the Klingons and the Romulons are too weak to be belived. Not to mention that the AI is NOT (intelligent, that is). When I play multi-player, I play the borg and it's a rare occasion when I loose ships and/or structures to anything but stupidity. The first thing I'd like to say about Armada is that it is definitely not just for Trekkies. I wouldn't remotely qualify as one, and I still loved it. Anyone who appreciates a good RTS should already have this. More than being good strategy, Armada is also an excellent graphical experience. The ships fight with cinematic intensity, with realistic damage and attractive projectile action. You can even go to a 'movie mode' where you can view a melee from a floating 3-D perspective (although at the expense of control). On the strategy side, there is only one resource- dilithium. You harvest it from dilithium moons that can be finite or infinite. It's a pretty straightforward resource model, and things are automated enough that you won't have to micromanage it. A welcome balance tweak is the starbase armament, which makes a rush basically impossible. Bad news for all the battle.net fools that like to send zerglings or zealots (you know who you are). Each race has an superweapon of immense power, but in every case they are prohibitively expensive and slow to build. If you see one anywhere in the first 20 minutes of the game, someone is probably hacking. However, once someone gets one, they have a pretty major advantage against anyone that's technologically deficient. You can also make good of the potentially powerful- though also very physically weak- science vessels each race offers. They're expensive and slow, but can be the deciding factor in a major battle. All of this serves to make advancing your tech a very feasible strategy over a simple 'build more warships, wear them down' method. The single play campaign is excellent. It has a neat plot and you'll see a lot of unique starships that you won't see elsewhere- such as the two Cardassian types, Dominion vessels, and a Breen battleship. None of the levels are especially hard, but they can take some thinking. I especially liked one where you have to pilot USS Avenger to safety with a Klingon fleet hot on your tail. Multi-play is probably the weakest aspect of the game. It's choppy even on a direct connection and hunting down every last one of your enemies can be utterly tedious. Playing online also makes the game notoriously crash prone, and if you have eight people in one game it is both extremely slow and crashy. The computer plays a lot like the Dark Reign AI, building up until it has a huge force and then trying to swamp you. If you survive that one big assault, the computer is plenty ready to die. Rather than improving the AI to be a bit smarter, the difficulty settings give it a handicap- a very huge one on hardest. They build things faster and everything costs less, so they can send a bigger attack at you earlier in the game. Now, I know enough about Trek to realize that some of the ships aren't accurately specified. The Defiant, especially, is incredibly weak for something that could take and dish out so much damage in Deep Space Nine. Nevertheless, the actual sides are very well balanced and the models are so well done that the specifications are a minor point. Each side has its strengths and weaknesses. For example, all Romulan ships can cloak, but the Romulans are at a severe penalty when being boarded or trying to board ships of other races. There were a few balance problems with special weapons- such as the chain reaction pulsar- but they have been fixed in updates. The patch also (in my case at least) makes the game far more stable. Be sure you download it. Being a Star Trek fan, I had high hopes for the game. The preview trailer was exciting and the demo was fun to play. Once I got the game, I played it for four hours straight! I just couldn't stop...I was hooked! Until...the game suddenly just...stopped. "What the-?!" Overall, this could have been the best Star Trek game I've ever played. You get to be the good guys and the bad guys. Building ships, starbases, taking over ships, and unique weapons made it exciting. The bugs were the only problem. The game needs a patch to make it stop crashing or else people would have to play the game saving it every 5 minutes. Graphics were great, but could have been better in my opinion. I wished they had used the same graphics as they did in the trailer in between the campaigns. One small detail I was disappointed in was the ending, though. It kind of left me with the thought, "That's it?" (After all that hard work). I was hoping for an ending movie like the beginning.